Welcome to the NBA Live 08 portal! 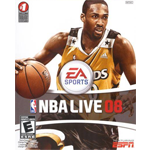 This is a central hub for all the NBA Live 08 content here at the NLSC including news, reviews, feature articles, downloads and more. Download the latest release from S_Brat, a face update for Denver Nuggets All-Star Nikola Jokic, in today's NBA Live 08 File Additions. Download the latest face updates from S_Brat, including a few new players from the 2018 and 2019 seasons, in today's File Additions for NBA Live 08.